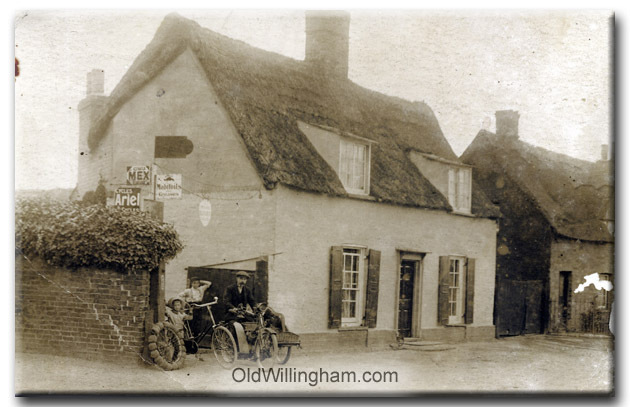 There are several pictures of this house on the OldWillingham web site at various periods. The house still stands on Rampton End and, for those who have lived in the village for 10 years or more, it was next door to the Milkmaid pub. When this picture was taken (pre WW1) Alec Norman, a well-known village mechanic and engineer had his workshop and garage at the property and here is sitting on a motorized bike with side car. Two boys are in the picture – the smallest holding a bike as big as himself. Faintly visible is a wrought iron sign over the drive that says “Alec Norman” with another white sign hanging in the centre saying “Rover Cycles.” Interesting Rover, with which we associate cars, actually invented the modern bicycle and made bikes and motorbikes until 1920s. Most likely this picture is showing off two of the bikes Alec had for sale.